1. Wrap the wool around your four fingers ( the more you wind the wool around your fingers, the fuller your pompom will be). 2. Carefully take off the wrapped wool from your fingers. Use another piece of wool (about 20cm) to tie the wrapped wool right in the middle. 3. Cut the edges with a sharp scissor and remove the excess until you have a tidy pompom (don´t cut the excess of the wool you used to tie the pompom in the middle because you will need it later). 4. 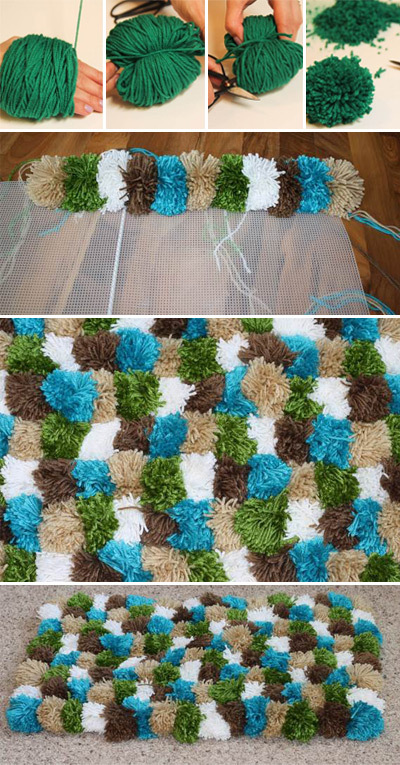 Make enough pompoms to cover all the surface of your non-skid rug. After you have a good amount of them, start tying the pompoms on your non-skid rug using the piece of wool you used to tie the pompom in the middle. Make sure you are placing them right next to each other to let your rug fluffy and well filled. When you finish cut the excess of wool in the back of your rug. 5. After all this work you will have a cozy and beautiful new rug for your house perfect for winter days and kids room! Enjoy it and keep it clean and far from wet places. What you need: Choose the wool colors you will use in this project carefully. Try to match nice colors that can go on well together or, if you prefer something more neutral, chose only one. You will also need a non-skid rug in the size you want your pompom rug to work as its base.